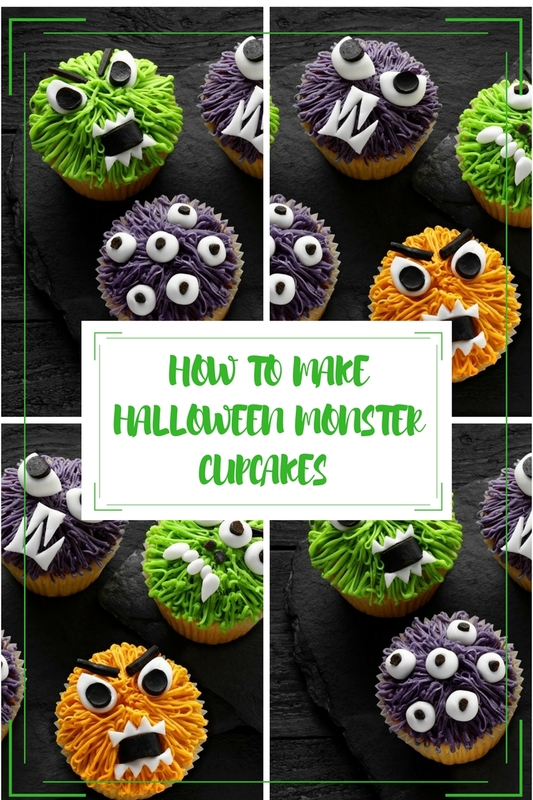 Are you looking for a fun Halloween monster cupcake recipe? How about making some of these fun and scary cupcakes? 1. Preheat the oven to 180°C (160°C fan oven, 350°F, gas mark 4). Put the Muffin Cases in 12 cupcake or muffin tins. Put the margarine in a bowl with the caster sugar, eggs and Vanilla Extract. Sift the flour on top. Using an electric whisk, gently mix the ingredients together until well blended. 2. Divide the mixture equally between the Muffin Cases. Smooth the tops and bake for about 20 minutes until risen, and lightly golden. Transfer to a wire rack to cool completely. 3. To decorate, put the butter in a bowl and beat until smooth. Gradually sieve and mix in the icing sugar to make a smooth, creamy icing. Stir in the Vanilla Extract. Divide into 3 equal portions and colour each with 2.5g (2.5ml/1/2 tsp) of a different Colour Gel, and mix well. 4. Spoon the icing into 3 uncut small piping bags or small, clean, sturdy plastic food bags. Snip a tiny corner from the bags. Working on one colour at a time, pipe thin strands of icing, in short lines, back and forth, working your way around the top of the cake, from the centre to the edge. Continue piping strands on top, in layers, to build up a “hairy” look. 5. When all the cakes are iced, knead the Regal Ice to soften it and then form into various sized eye shapes and teeth – use a little icing sugar to stop the icing sticking. Cut up small pieces of liquorice and push into the eyeballs, and use some for open mouths, nostrils and eyebrows. Arrange all the pieces on top of the cakes to make monster faces. Your cakes are now ready to serve, scare and enjoy! The great thing about making these colourful monsters is that you don’t need any special equipment. If you don’t have piping bags, choose a small plastic bag that is made from quite thick polythene. If the plastic is too thin, the bag may burst when you are squeezing out the icing. Trim away the tiniest piece of the bag corner to pipe through in order to achieve the thinnest of piping; this way you will achieve the best “hairy” effect for your monsters. If you’re not a fan of liquorice, check out the range of Dr Oetker Extra Strong Food Colour Gels which includes Black so you can colour up your own Regal Ice to make it black. Also, Dr Oetker Ready to Roll Icing packs contain readymade packs of Black Icing as well as bright Green, Yellow, Blue and Red colours so you can make up even more “monsterous” designs! 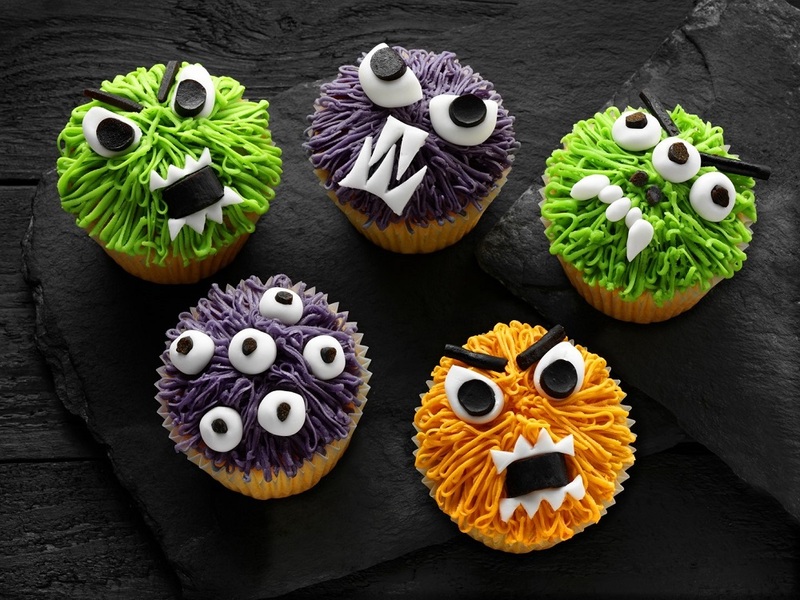 How To Make Halloween Monster Cupcakes Recipe and image courtesy of Dr Oetker. Try now or pin for later? "The Greatest Road Trip In The World"
"High Fives All Around: The Wednesday Blog Hop"
Super Cute! Super fun! = LOVE THEM…Would love to have you come share at Reader Tip Tuesday: http://www.jodiefitz.com/2017/10/17/reader-tip-tuesday-weeks-craft-recipe-party-8/It's open and growing all week long..hope to see you there. Thanks for the invite. Stopped by and joined you.